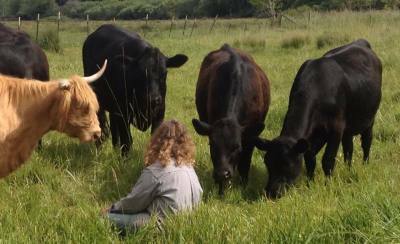 We strive for maximum health - of the soil, the water, the forage, the animals, and all people touched by our farm. Our goal is to synergistically weave together the natural characteristics and behaviors of each layer of our ecosystem to create a vibrant and sustainable whole. No corn. No soy. No antibiotics in the feed, no growth hormones. Pasture, water, minerals, and love. Genetically the same today as 1100 years ago, Icelandic sheep are possibly the oldest and purest domesticated breed of sheep in the world today. The fine-grained meat has a distinct, delicate flavor, and is relatively low in fat. Raised gently on my farm, the leaner meat and milder flavor can appeal to the palate of even those consumers who "just don't like lamb". Pork raised completely on pasture, fed Scratch and Peck's excellent organic, GMO-free, soy-free, corn-free pig food soaked when possible in the extra milk from our milk cows. That's about as good as it gets! We farm in an old-fashioned way so you can eat meat that really tastes good, and is good for your body. In addition to people who simply enjoy a rocking good meal, we have a growing clientele of people with health issues who can only eat pure foods. We are delighted to see our efforts bringing this extra benefit to our customers. Food as nature designed it. It's good for the planet. It's good for us, too.